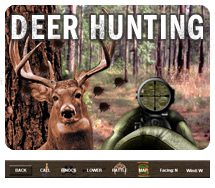 Play free 3D Shockwave Deer Hunter Online games. To start, select Fall or Winter Hunting. Then select Hunting Cover Stand and Sporting Arm. The first stand is populated with younger deer that are curious with small racks. The later stands are populated with deer that are progreesely older, more wary with larger racks. Click Hunt to see a larger view. Hold the cursor over the left and right edges of the window to scroll, or use your arrow keys. Once a deer is in view, get a bead on him and click the mouse to fire! Credit: ESPN sports.